In recent years stretch ceiling systems have gained popularity in America and Europe thanks to curious consumers seeking out the latest in decorative ceiling options. Homeowners who have installed a stretch ceiling certainly appreciate the aesthetics and value they add to their home. In this post, we’ll introduce and explain the features and benefits homeowners can expect from a stretch fabric ceiling system. DESCOR and Clipso are the most popular stretch fabric ceiling brands on the market today due to their proven quality and performance. These companies have been innovators in the industry, introducing new technology for manufacturing stretch ceiling systems that has begun to displace the old production method using polyvinyl chloride (PVC) film. The resulting material is made from woven polyester fibers coated with polyurethane. This process allows for the installation of gorgeous seamless systems that are more and more in demand. New production methods allow for a maximum width canvas of 16 feet, 8 inches. This makes it possible to cover most ceilings seamlessly. Fitting and trimming of the material is done on site, which greatly simplifies the process and shortens the work period. As opposed to the PVC film, we do not need to tailor the membrane to the size of the room at a factory. All of this provides for a quick and cleaner installation, which consumers undoubtedly appreciate. The strength of these stretch fabric coverings is significantly greater than the older PVC film. In fact, these fabric systems are almost impossible to break. This allows for installation in all kinds of rooms meant for many different uses. These systems have been installed in restaurants, basements, rec rooms, kindergartens, saunas, and more. The possible applications for a stretch fabric ceiling are only limited by the imagination. The simplified installation technology is attractive to both contractors and designers wanting to offer quick and clean processes to their clients, as well as DIYers hoping to install their own ceiling. The canvas can be stretched quickly without preheating, the old ceiling does not have to be removed, and the application process usually only takes a few days in most homes. DESCOR or Clipso stretch ceilings make it possible to add unique design features in any room. A graphic image can be digitally printed right on the material, and the fabric can even be outfitted with spectacular internal lighting systems (or backlit) as well, resulting in a completely bespoke, luminous ceiling. When comparing film and fabric ceiling systems, fabric definitely edges out film for being environmentally friendly. The fabric ceiling contains only safe components that cannot emit harmful substances into the environment, making it completely safe for the duration of the ceiling’s lifetime. These ceilings are so safe, they can be installed in rooms that are designated for children or used in hospitals. It is also important to highlight fire safety when considering the benefits of fabric systems—the materials are entirely fire-resistant. Descor and Clipso manufacturers provide a 10-year guarantee on its products. In addition to this, Descor ceilings are covered by a Lifetime Residential Warranty in the United States, offered by Popcorn Ceiling Solution. Both Descor or Clipso products can be used in a variety of applications and structures. In fact, fabric systems don’t have to be used only for their intended purpose as ceiling coverings, they can also be used to finish other surfaces—billboards, walls, and so on. Descor Stretch fabrics are available in a wide range of finishes, but there are three main types: Standard, Acoustic, Translucent and Star—a glitter-like sparkling fabric finish. 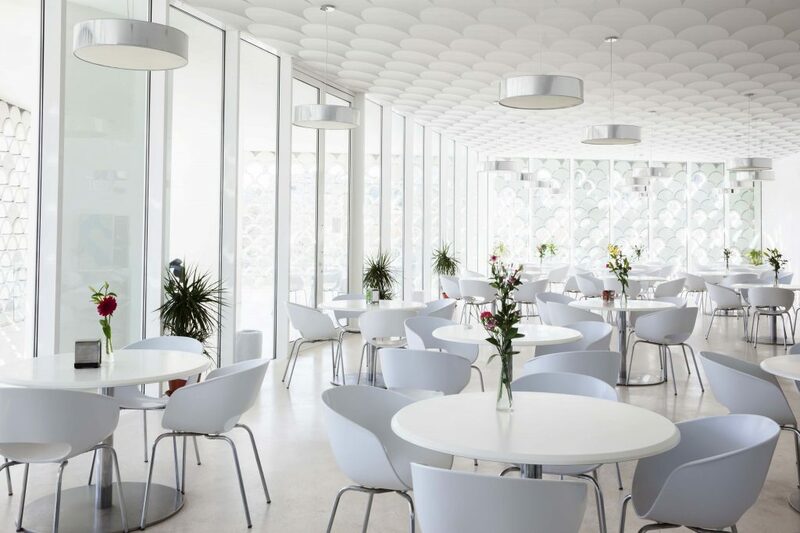 To achieve that classic white-ceiling look, the manufacturer offers standard white materials that once installed, look like a seamless flat surface. You can choose colored options as well, which are available in dozens of different tones. Most notably, translucent fabrics can be combined with internal LED lighting systems. These are called backlit stretch ceilings. You can choose custom graphic designs to be backlit as well. This option can be used to create exclusive interiors where the ceiling itself becomes a luminous work of art. If the system is to be installed in a hospital or other medical facility, you can choose an antibacterial fabric ceiling. These have a special covering that eliminates the appearance and development of harmful bacteria. The ceilings can also be made waterproof if they are installed in swimming pools or bathrooms. It is worth remembering that your ceiling will most likely need to last much longer than the 10 years guaranteed by the manufacturer. That is why it’s important to choose a high-quality system that you truly love. When you weigh the features, benefits, and possibilities of a stretch fabric ceiling, it becomes a great investment in your home that will enhance the enjoyment of your space for years to come. We are happy to offer you a free, in-home consultation so you can see for yourself the value of this product.